The reveal. Several months ago I showed you a stack of fabrics; then I revealed small details about what I was doing with it. Well, the quilt has been delivered and I can now show you what resulted. This will be a surprise for several of you who thought it had something to do with shoes, as in someone wearing them. 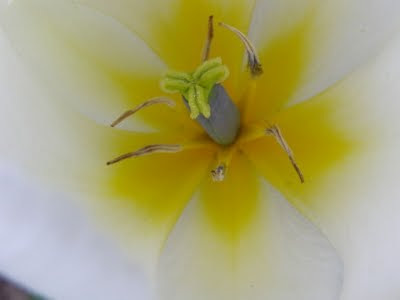 One of the previous posts had a detail of the "e", which sort of resembled the toe of a shoe. Even Rose thought it would be a witch wearing red shoes! 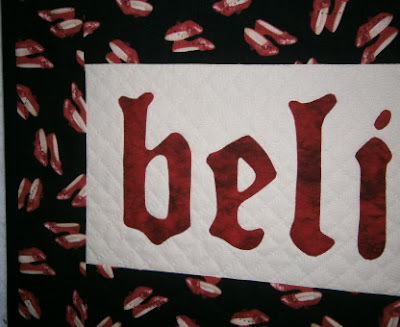 The lettering was transferred to the red fabric and then basted to the cream. Each letter was then appliqued using a cutaway technique. (The lettering is from A Quilter's Alphabet by Anita Shackelford, www.anitashackelford.com.) Here's a detail. The lettering was outlined, then the background filled with a 1/2 inch grid. The borders have two gentle wavy lines. 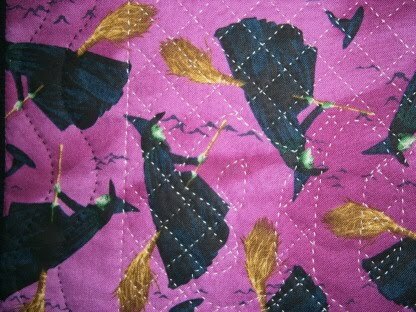 The witch fabric was the one I had to order and wait for! And here is the label. 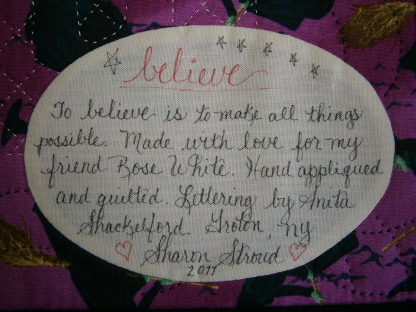 Rose received the quilt on Friday, along with an assortment of believe-related items. She thought it was worth the wait. You can read her comments on the last post. So that's the scoop for today. 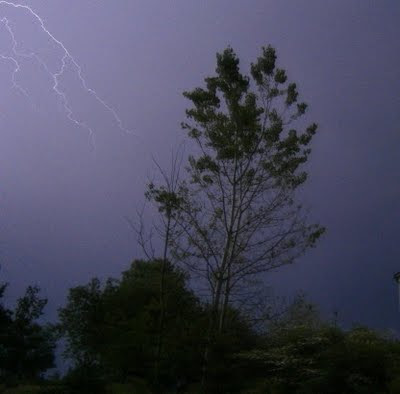 I did try to post this last night, but Blogger refused to accept my pictures. This morning it was no problem. Go figure. Tonight I thought I would share some pictures I took earlier this spring. 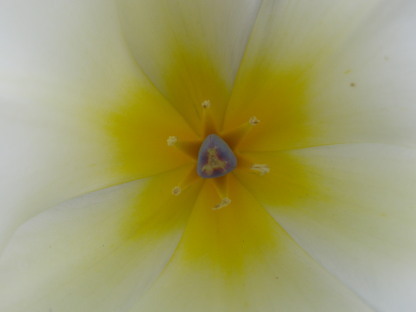 It always amazes me how much detail there is in something that looks so simple. Isn't this the coolest star center ever? And this looks like it should be a bug or something! Happy whatever-day-it-is-for-you! Next will be more finishes. And, yes, I did finally get the mystery quilt in the mail today. She should have it Friday, so I will post pics of that then. I am pleased with it. Have been making and appliqueing labels. Finished a baby quilt top too! P.S. I just finished Tick Tock by James Patterson and Michael Ledwidge. Just started Dark Horse by Tami Hoag. And I'm still reading the Pioneer Woman's book. It's fabulous--and long. But you don't want to miss a single word. Nothing beats a quick baby gift for just pure piecing joy. 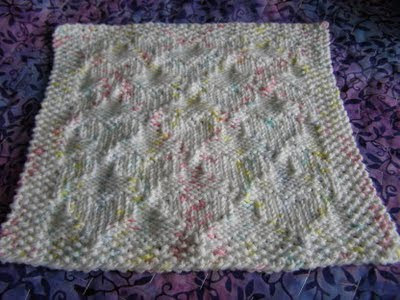 The baby in question was actually born in March, and I did have the top pieced before that. But...life intervened and it was just Tuesday when I finished and gifted this. Made from flannels, Mountain Mist batting and tied with pearl cotton. 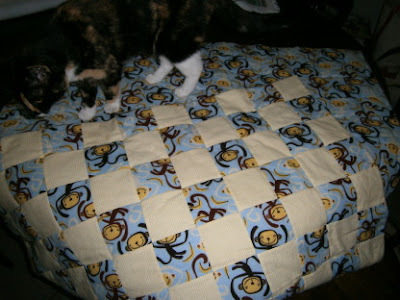 Hard to see in the pics, but the "not monkey" fabric is a pale white and yellow stripe. I like to tie to the back so that the top is not as busy. You can see the ties at the top of the picture. 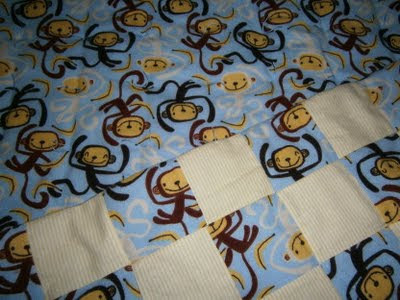 Monkey fabric was the backing. Here's Callie --aka "Inspector 12"--making sure I did a good job. And, to complete the gift, the book Five Little Monkeys Jumping on the Bed. It's a fun book--even for adults! So there you have it--another finish. I actually have two more finishes which I will share soon. And I am working on a little something for my best friend, who is soon to be a first-time grandma. I cut the top tonight and have about 1/3 of the blocks pieced and on the design wall with the alternate plain blocks. I think it will be really cute--okay, no bias there! Spent most of the day working in the yard. Did some mowing, trim mowing, weeding and weedeating. Didn't get finished because it started to rain, and I bent the blade on my trim mower. Bummer...especially since I didn't hit anything hard that would have caused it. Dee dee dee dee! That's all for this time. Are you remembering how special you all are? On Thursday I had the privilege of spending the day with ladies from the Endless Mountains Quilt Guild in Sayre, Pennsylvania. These ladies are so much fun! Can you believe that several of these dedicated women continued to applique on the class project throughout the evening--and five of them finished the center applique. Here are the smiling faces of (l to r) Traci, Marie, Kelly, Mary, and Sue. What a great job, ladies! I'm so very proud. Okay, enough nonsense for tonight. 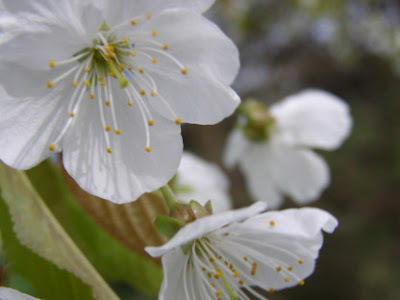 Many thanks to all who commented on the blog or to me in person about Floyd. It meant a great deal. P.S. I am listening to Secrets from the Grave by Tami Hoag; it's the sequel to Deeper than the Dead. There are several reasons that I am sharing this story today. One is because "Mitten-Stater" suggested it (she already knows it and thought I should share it more widely) and because today is an anniversary. Back in the late 1970's my friend Cindy and I had taken a road trip to Lake Placid, NY. We spent a week touring the mountains and went to the Olympic site (pre-renovation for the 1980 Olympics) and had a great time. Cindy was either engaged or pretty serious about Ron, who became her husband. I was foot loose and fancy free. To make a long story slightly shorter, I returned Cindy to her parents' home and started back to my home. Part way back I realized that I had forgotten to check my oil before the trip. So I pulled into Longway's Truck Stop near Watertown, NY, to do so. I pulled in between two big rigs and popped the hood on my little yellow Buick. As I was under the hood, a man came over and said "Do you know what you're doing?" And, bold as brass, I responded, "Yes, quite frankly, I do!" Not deterred, this gentleman struck up a conversation which extended to several hours. At the end of our time together, he asked for my phone number and said he would call me. I figured that was the last I would ever hear of him. Imagine my surprise when he called me that night...and the next night...and every night for over 25 years. We dated long distance for almost two years before we were married. I can honestly say that my heart raced whenever I saw him--and that happened all through our marriage. I rode in the truck with him for over a year--visiting 44 of the 48 contiguous states. For quite a while we hauled yachts all over the country. I have seen him put an over-wide boat into an alley with only inches to spare on each side, backing in from a narrow roadway with traffic coming both ways. Just amazing. 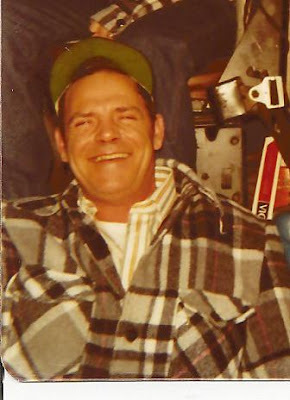 A kind and generous man who loved me with all his heart. This memory is especially poignant today; he's been gone seven years today. 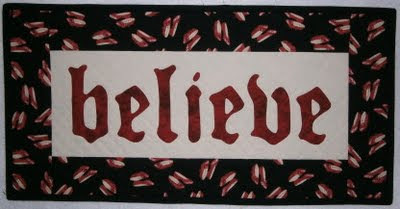 He was the one who encouraged me to follow my quilting dreams and made my life special in so many ways. I miss him every day. If my math is correct, this is finish 3 for the year to date. 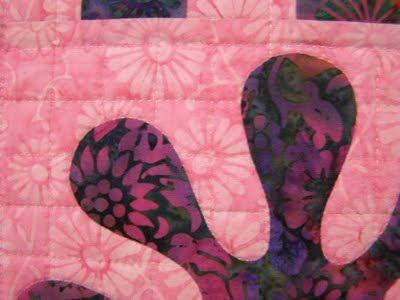 Hand appliqued, machine pieced and hand quilted. I am quite pleased with it. 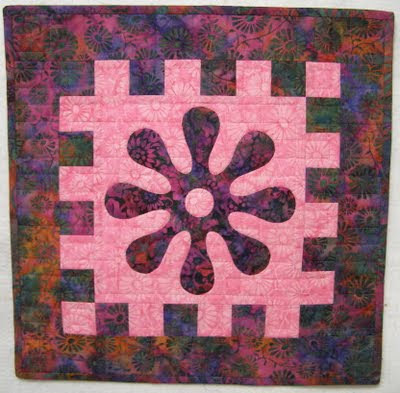 A detail of the applique and the quilting. On Saturday, I went to a wonderful bridal shower for my best friend's daughter. 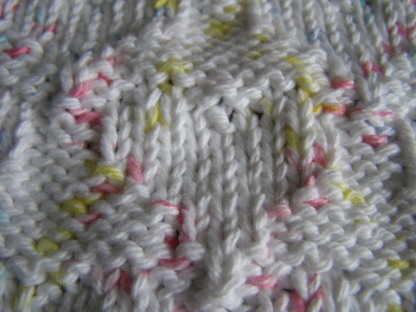 So last week I spent spare evening moments knitting this dishcloth. It has hearts knitted in it--appropriate for a bridal shower, don't you think? And a detail. Made of cotton yarn. Earlier today I heard something just outside my sewing room window. 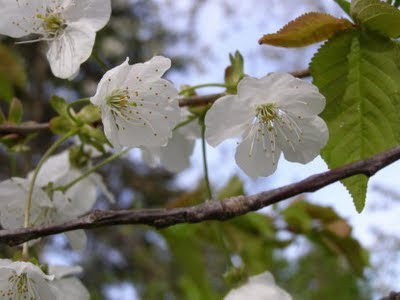 When I went to look, here's what I found. 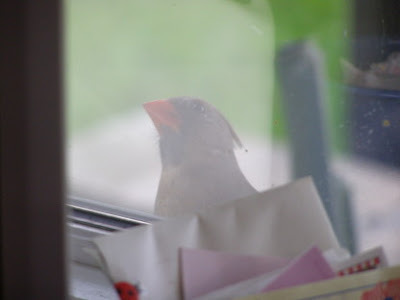 A female cardinal doing her best to get in! The picture is not the best because of the tint on the window. I think she was looking at herself on the other side, which acts as a mirror. She was there for quite a while, alternating between the window sill and the shringle bush near it. I have spent the day appliqueing and weedeating. What a combination! But my new weedeater works great and is so much more advanced than my old one (let's just say it was into double digit years and the motor was smoking the last time I used it--and it is electric). Tomorrow I am going to share a story with you--something personal that not many of you know. So stay tuned. P.S. If you are wondering why the spacing is so spastic on the posts, it is because I have given up trying to figure out how to edit html to get it right. 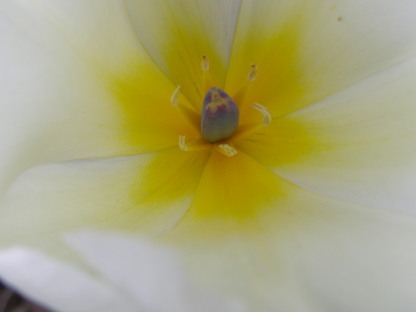 WYSIWYG does not apply to editing this blog. I think others have given up as well--but it torques my cookies not to have it look better. Just sayin'. 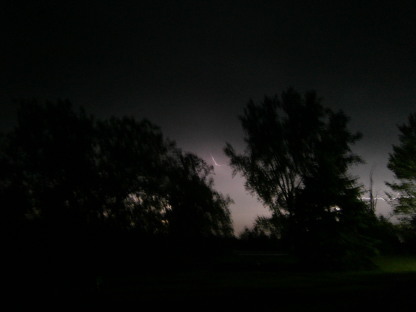 Several nights after I took the other storm pictures, we had another one--with even more lightning. 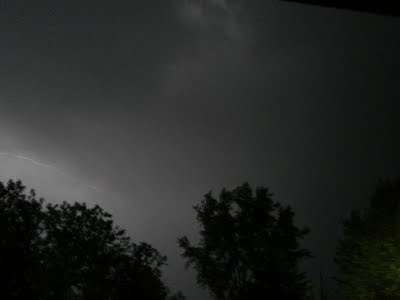 As you are viewing them, remember this is the middle of the night and the sky was pitch black when there was no lightning. 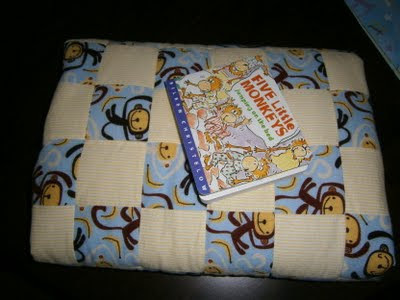 I have been quilting--show and tell for that is up in the next post. At least it is a bit cooler tonight--much better for sleeping! P.S. Listening to Heart of Dixie by Tami Hoag.